Have a day of magic on the 7th (Sun) at Walt Disney World Resort. Pack the 9th (Tue) with family-friendly diversions at Universal's Islands of Adventure. The adventure continues: get in on the family fun at Universal Orlando Resort. To find photos, ratings, and more tourist information, read our Orlando trip planner . Manchester, UK to Orlando is an approximately 13.5-hour flight. You can also do a combination of flight and bus; or do a combination of flight and shuttle. You'll gain 5 hours traveling from Manchester to Orlando due to the time zone difference. Traveling from Manchester in July, expect Orlando to be much hotter, temps between 38°C and 28°C. Cap off your sightseeing on the 9th (Tue) early enough to go by car to Weeki Wachee. Weeki Wachee is a city located in Hernando County, Florida, United States. On the 10th (Wed), admire nature's wide array of creatures at Wildlife Survival Sanctuary, paddle through the water with a kayaking and canoeing tour, and then stroll through Bayport Park. For reviews, more things to do, and tourist information, refer to the Weeki Wachee sightseeing planner . Drive from Orlando to Weeki Wachee in 2 hours. Alternatively, you can do a combination of train and taxi; or do a combination of bus and taxi. July in Weeki Wachee sees daily highs of 38°C and lows of 26°C at night. Wrap up your sightseeing on the 10th (Wed) to allow time to drive to Gainesville. Gainesville is the county seat and largest city in Alachua County, Florida, United States, and the principal city of the Gainesville, Florida Metropolitan Statistical Area (MSA). On the 11th (Thu), identify plant and animal life at Butterfly Rainforest, get a new perspective on nature at Florida Museum of Natural History, then look for all kinds of wild species at Sweetwater Wetlands Park, and finally identify plant and animal life at Carson Springs Wildlife Conservation Foundation. For traveler tips, where to stay, other places to visit, and more tourist information, go to the Gainesville trip planner . Getting from Weeki Wachee to Gainesville by car takes about 2 hours. Other options: do a combination of car and bus; or take a bus. In July, daily temperatures in Gainesville can reach 38°C, while at night they dip to 26°C. Wrap up your sightseeing on the 11th (Thu) to allow time to drive to Jacksonville. Kick off your visit on the 12th (Fri): meet the residents at Jacksonville Zoo & Gardens, then identify plant and animal life at Catty Shack Ranch Wildlife Sanctuary, and then test your team's savvy at popular escape rooms. To see maps, reviews, ratings, and other tourist information, use the Jacksonville trip planning website . Traveling by car from Gainesville to Jacksonville takes 1.5 hours. Alternatively, you can take a bus; or do a combination of bus and train. In July, plan for daily highs up to 39°C, and evening lows to 26°C. Finish up your sightseeing early on the 12th (Fri) so you can go by car to Tallahassee. Tallahassee is the capital of the U.S. On the 13th (Sat), contemplate in the serene atmosphere at Co-Cathedral of St. Thomas More, then don't miss a visit to Florida State University, then learn more about the world around you at Tallahassee Museum, and finally admire the majestic nature at Edward Ball Wakulla Springs State Park. To find more things to do, other places to visit, reviews, and more tourist information, read Tallahassee route planning tool . Getting from Jacksonville to Tallahassee by car takes about 3 hours. Other options: take a bus. In July, plan for daily highs up to 39°C, and evening lows to 27°C. Wrap up your sightseeing on the 13th (Sat) to allow time to travel to Tallahassee. Kick off your visit on the 14th (Sun): look for all kinds of wild species at St. Marks National Wildlife Refuge, then see the interesting displays at Tallahassee Antique Car Museum, and then take in nature's colorful creations at Alfred B. Maclay Gardens State Park. On the next day, stroll through Cascades Park, take an in-depth tour of Florida Historic Capitol Museum, then get engrossed in the history at Museum of Florida History, and finally enjoy breathtaking views from New Capitol Building. To find maps, other places to visit, where to stay, and tourist information, read our Tallahassee online trip itinerary builder . Finish your sightseeing early on the 15th (Mon) to allow enough time to drive to Apalachicola. Apalachicola is a city in Franklin County, Florida, United States, on the shore of Apalachicola Bay, an inlet of the Gulf of Mexico. Kick off your visit on the 16th (Tue): look for gifts at Downtown Books & Purl, see majestic marine mammals with a dolphin and whale watching tour, and then admire the majestic nature at Saint George Island State Park. For reviews, other places to visit, ratings, and more tourist information, use the Apalachicola day trip planner . Getting from Tallahassee to Apalachicola by car takes about 2 hours. In July, daily temperatures in Apalachicola can reach 38°C, while at night they dip to 28°C. Cap off your sightseeing on the 16th (Tue) early enough to go by car to Panama City Beach. Kick off your visit on the 17th (Wed): do a tasting at Panama City Beach Winery, then see majestic marine mammals with a dolphin and whale watching tour, and then get close to the beloved marine mammals with a swim-with-the-dolphins experience. To find maps, ratings, where to stay, and more tourist information, refer to the Panama City Beach route website . You can drive from Apalachicola to Panama City Beach in 2 hours. In July, daily temperatures in Panama City Beach can reach 38°C, while at night they dip to 27°C. Finish up your sightseeing early on the 17th (Wed) so you can go by car to Pensacola Beach. Pensacola Beach is an unincorporated community located on Santa Rosa Island, a barrier island, in Escambia County, Florida, United States. 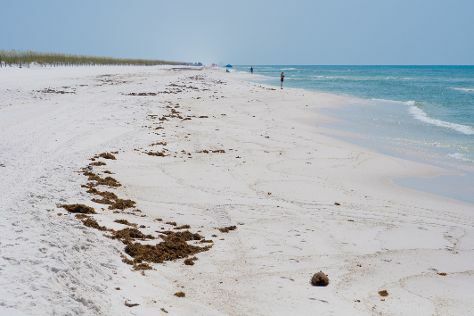 Start off your visit on the 18th (Thu): tour the pleasant surroundings at Pensacola Beach, stroll through Gulf Islands National Seashore, and then steep yourself in history at Fort Pickens Area. For other places to visit, photos, ratings, and tourist information, read our Pensacola Beach online day trip planner . Getting from Panama City Beach to Pensacola Beach by car takes about 2.5 hours. You'll gain 1 hour traveling from Panama City Beach to Pensacola Beach due to the time zone difference. In July, daily temperatures in Pensacola Beach can reach 38°C, while at night they dip to 28°C. Finish your sightseeing early on the 18th (Thu) to allow enough time to drive to New Orleans. Start off your visit on the 19th (Fri): admire the striking features of St. Louis Cathedral, then stop by Faulkner House Books, then make a trip to French Quarter, and finally tour the pleasant surroundings at New Orleans City Park. Keep things going the next day: examine the collection at The National WWII Museum, take a stroll through Garden District, and then get to know the fascinating history of Jackson Square. Traveling by car from Pensacola Beach to New Orleans takes 4 hours. Alternatively, you can take a bus; or do a combination of taxi and flight. Traveling from Pensacola Beach in July, you will find days in New Orleans are slightly colder (31°C), and nights are about the same (31°C). Finish up your sightseeing early on the 20th (Sat) so you can travel back home.